Captain Noble is from Cromwell, Connecticut. After his graduation from the Middletown High School, he entered the Naval Academy on June 12, 1917. His first assignment was aboard the battleship Pennsylvania. He served aboard five years, then was ordered to the destroyer W. B. Preston, which was attached to the Asiatic Fleet. From 1926 to 1929 Captain Noble, with the rank of Lieutenant, studied ordnance at the Post-Graduate School. Afterwards, he served for three years as anti-aircraft control officer on the battleship California. He spent the two following years of service as Ammunition Officer and Assistant Experimental Officer of the Naval Proving Ground at Dahlgren. The duty at the N. P. G. was followed by one year as staff gunnery officer of Destroyer Squadron Twenty. Leaving DesRon 20, Lieutenant Commander Noble reported to the Bureau of Ordnance for duty as Assistant Chief of the Fire Control Section, where he served two years. He was then placed in command of the destroyer Downes, and after twenty months of this duty, which saw him at Pearl Harbor at the outbreak of hostilities, was returned to the Bureau of Ordnance. After a time he became Chief of the Fire Control Section of the Production Division. During this latter period Commander Noble was promoted to the grade of Captain as of June 20, 1942. 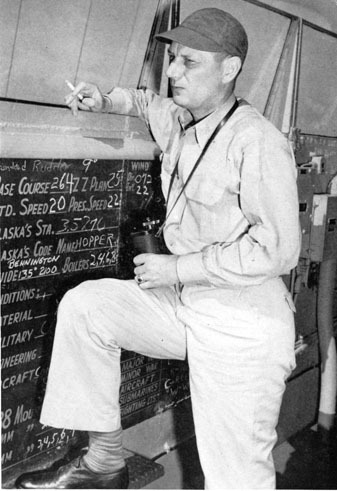 He was placed in command of the Alaska during colorful military ceremonies on January 21, 1945, in Hawaii. Captain Noble was married September 10, 1927, to Miss Anna Hanson Iglehart, of Annapolis. They have one son, Thomas Iglehart Noble, and one daughter, Miss Mary Hill Noble. Their permanent home is in Washington. D. C.